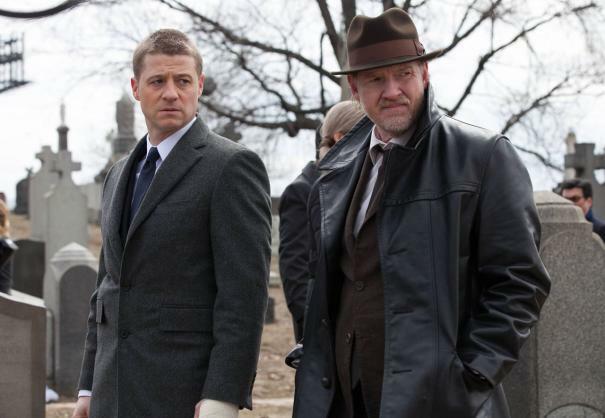 Monday night marked the premiere of Gotham, Fox’s entry in the “hey comics are ‘in’ right now so let’s make a TV show” sweepstakes – and boy, was it a TV show that came on TV! The premise of the show is simple: it’s a cop drama focusing on James Gordon before he became police commissioner, before there was a Batman, before Gotham City became a haven for lunatic clowns and Two-Faced ex-lawyers. Only…it isn’t, really? Based on the pilot episode, it looks like the only thing that’s not going to show up on this show is Batman. This cat…girl…is spooked by a family as they enter the alley, all laughing and having a grand old time, talking about the movie they just saw. Then, out of nowhere, a guy in a mask comes up to them, demanding the mother’s necklace and the father’s wallet. Even though he gets both without any protest, he still decides to shoot both of them, leaving the young boy alone to kneel by their bodies and screech into the night. The catlady watches and poses. Bullock and Gordon get the call to check out the homicide, and when they get there Gordon immediately goes over to the son to take his statement, while Bullock chit-chats with another cop. He’s told that the murdered couple is Thomas and Martha Wayne, which terrifies him, because apparently this means he’ll have to do cop stuff? I don’t know, I guess that’s bad. The son, Bruce, gives Gordon a description of the killer, mentioning his “shiny shoes.” Gordon decides to tell Bruce the story of how his own parents were killed by a drunk driver – which, honestly, is kind of weird since they just met and Bruce just saw his parents murdered. Gordon also tells Bruce that “there will be light” which is also kind of weird. Gordon promises Bruce that they’re going to find his parent’s killers, as the Wayne’s butler, Alfred, shows up to take Bruce away. THEN THE OPENING TITLES HAPPEN. We come back to find Bullock and Gordon in a diner, discussing the case. Bullock is telling Gordon how he shouldn’t have talked to Bruce, because now they’re stuck having to do police work and try to close the case. He also calls Gordon “Holmes,” for some reason. Detectives Montoya and Allen, from the Major Crimes Unit, show up and ask if Bullock wants to hand off the case. There’s some smart talk, and Bullock says they’re going to keep the case, and once they’ve sat down, Bullock calls them “Skullhuggers.” I don’t know what this word means. Up next, there’s a pretty inconsequential scene in the Chief’s office and a “chasing after/interviewing perps” montage – after which we find ourselves back at the police station, where Gordon and Bullock get information on the bullet that killed Thomas Wayne from a nerdy guy named “Ed.” Ed starts to ask a question of the officers, but Bullock stops him, saying “don’t ask, just tell!” which only makes sense if you know that the dialogue is actually setup for something. Which it is. Because, y’know, he could have had an actual question for the detectives. After telling them about the bullet, Ed asks a riddle, which I didn’t write down, but Gordon immediately answers him, which annoys Ed. As they leave, Bullock says “Nygma, you need professional help.” YOU GUYS YOU GUYS IT’S THE RIDDLER DID YOU SEE IT’S THE RIDDLER. They decide to go see “Fish Mooney” at her club to get information – when they show up, it turns out she’s in the back alley with some of her people, beating up a guy for stealing her money. She has a skinny guy with a weird nose holding an umbrella over her, because it’s raining. She goes in to the club to talk to the detectives, and the other thugs ask the guy with the umbrella, whose name is “Oswald,” if he wants to take a turn beating up the thief – he does, and they all giggle. 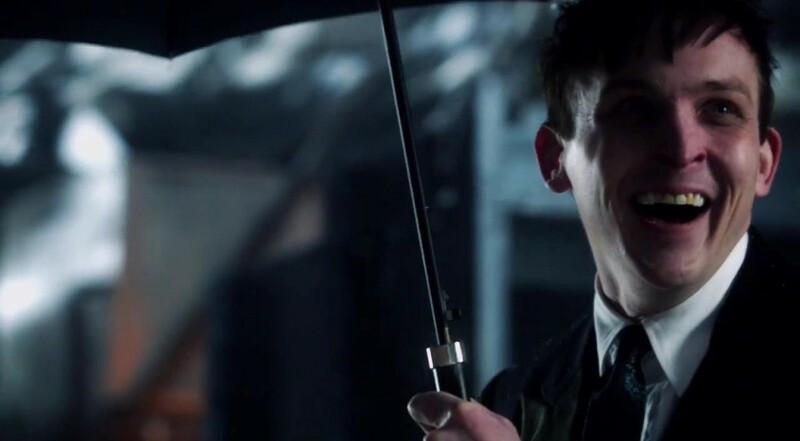 One of the guys calls Oswald “Penguin” and OH YOU GUYS WAIT THIS IS THE PENGUIN. For those keeping score at home, we are less than halfway through the first episode of this show and three of Batman’s major villains have been introduced, while Batman himself is still a pre-pubescent. We cut to a swanky apartment, where an attractive blonde lady slowly walks through a living room towards Gordon. She comments on his “excellent suit.” Then, Gordon talks her out of going to whatever thing they were supposed to go to (which is presumably the reason she’s all dressed up?) They talk about the Wayne case, and he tells her that he made a little boy a promise, and by gum, he’s gonna keep it no matter what. Then they totally make out. An unspecified amount of time passes, and we cut to Gordon’s flip-phone vibrating in front of a fireplace – it’s Bullock, calling from a loud bar (while doing shots!) telling him that they have a lead on the case, and Gordon needs to meet him in an hour. Then there’s an external shot of the city, and it’s obviously daylight, which makes me wonder what time the bars close in Gotham City. Bullock is sitting on a stoop, drinking from a flask. He explains that they’re at the home of a “Mario Pepper” and he has a tip that Pepper was seen with a necklace just like Martha Wayne’s! They knock on the door of his apartment, and a little girl answers – Gordon asks her name, and she says “Ivy” (HEY, WAIT A MINUTE) – when they ask to speak to her dad, she says they don’t want to, because “he’s mean.” They eventually end up inside the apartment, where Ivy is seen fiddling with one of the many plants strewn about the apartment. HOLY CRAP YOU GUYS, THIS IS POISON IVY YOU GUYS POISON IVY RIGHT HERE. After asking him a few questions, Mario flips the kitchen table and takes off, leading Gordon on a chase over a rooftop, through what looks to be a sweatshop, a commercial kitchen, and an alley. One thing I want to note here: this chase scene was super weird, in that they would occasionally interrupt the shots of Gordon chasing Pepper with close-ups of Gordon’s head and torso, head-on, huffing and puffing as he ran. It was really off-putting. ANYWAY, once they’re in the alley, Gordon and Pepper get into a fight, and Pepper is about to kill Gordon when Bullock shows up and shoots Pepper. Back at the apartment, the police easily find the necklace, along with some drugs, which means: case closed! Everyone gives Bullock and Gordon high fives and they get to be on the front page of the newspaper. Penguin, however, knows better, and tells Montoya and Allen that Pepper was framed by Gordon and Bullock and Fish Mooney. We cut to a cemetery, where the funeral of Thomas and Martha Wayne is taking place. Catgirl is posing on top of various grave markers, in broad daylight, in a cemetery full of people, yet no one seems to notice. Bruce thanks Gordon for keeping his promise. Montoya shows up at Barbara’s apartment, and she accuses Gordon of being a dirty cop, by way of reminding Barbara (and informing the audience at home) that they used to make out. After Barbara questions Gordon about it, he stomps up to Montoya and there’s some posturing and big-talk and he vows to find out the truth. He goes back to Pepper’s apartment, and digs through his closet, looking for a pair of shiny shoes, which are not there. This is all Gordon needs to see to know that they did in fact frame Pepper. Although, when you think about it, they could’ve just buried the guy in his fancy shoes, but whatever. Gordon asks Bullock about it, and Bullock refers to Montoya as a “pill head looney bird,” whatever that is. He tells Gordon that they couldn’t have framed Pepper, but if they did, they definitely couldn’t admit it, because they ended up killing him, and they’d lose their jobs, killing an innocent man. Which I get, except for the fact that Pepper tried to kill Gordon like a billion times in the space of a few minutes, which would probably give him an “out.” Bullock tells Gordon to let it drop, so Gordon decides to bust up into Mooney’s club, get beaten up, and then be dragged to a slaughterhouse to be murdered on camera. After finding out from Barbara that Gordon never came home, Harvey shows up at the slaughterhouse and asks the thugs to call Mooney – he interrupts her as she’s watching a random comedian perform for her (OH. NO.) and Bullock informs her that she has a snitch in her organization – he also tells her she can’t have Gordon killed, because then he’d have to “do something,” which causes Mooney to order her guys to knock out Bullock and hang him up as well. Back at the slaughterhouse, a random guy in a mask and chainmail comes out of the back, picks up a meat cleaver, and makes his way towards Bullock and Gordon. At that exact moment, Carmine Falcone and a few of his goons walk in and kill everyone. Falcone and Gordon go for a walk and Falcone tells him how he knew Gordon’s father, which means maybe his dad isn’t as good as he thought? In any case, Bullock and Gordon drive to the docks, and Bullock pulls Penguin out of the trunk, and says that Falcone says Gordon’s got to kill him, so they’ll know they can trust Gordon. Bullock says that if he doesn’t, Bullock will have to kill both of them. 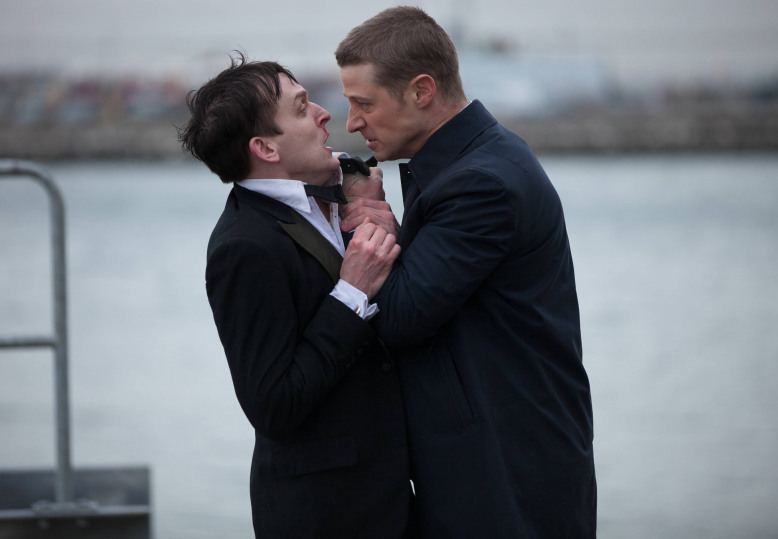 So, Gordon makes Penguin walk to the end of the dock (he’s waddling, now, after getting beaten by Mooney,) pretends to shoot him in the head, and pushes him into the river, telling him to never come back to Gotham. After this, Gordon goes to Wayne Manor, only to find Bruce standing on the edge of the roof. After Alfred gets him to come down, Gordon apologizes to Bruce for not actually finding his parent’s killer, and then proceeds to tell Bruce the entire story, including all the things that could implicate Gordon, and asks that Bruce keep it all a secret. This is an insane level of trust between a grown-up adult and a young boy that only met one another like a week ago. As Gordon leaves, we see Catgirl posing on the main gate of Wayne Manor. In broad daylight. I mean, Gordon drives right past her. I’m now officially concerned about his detective abilities. Finally, we see Penguin pull himself out of the water, kill a fisherman, and go full Danny DeVito on the guy’s sandwich. I’m really not sure what kind of show Gotham is supposed to be. It’s not a very good cop drama, and the main pilot is just an endless succession of Easter eggs aimed at Batman fans. I’m terrified that we’re going to have pretty much every single Batman villain on the show before Bruce’s voice even cracks. 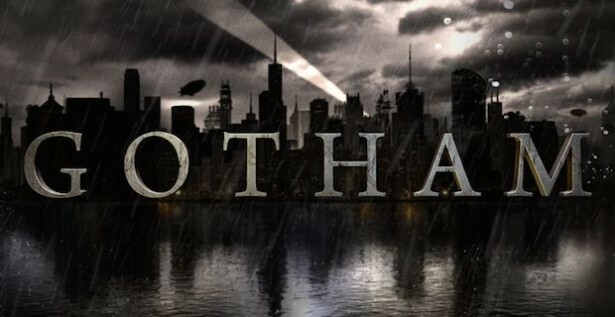 So far, I just find myself really wishing they’d make a show based on Gotham Central, but we’ll see how it goes! Written by Nick Doyle. Follow Nick on Twitter: @nicholasdoyle. This post contains Amazon product links. Shopping at Amazon through these links helps keep Tuesday Night Movies going! Jada Pinkett Smith is GREAT as Eartha Kitt Catwoman. I will keep reading this hilarious recaps if you keep writing them. Thanks so much!